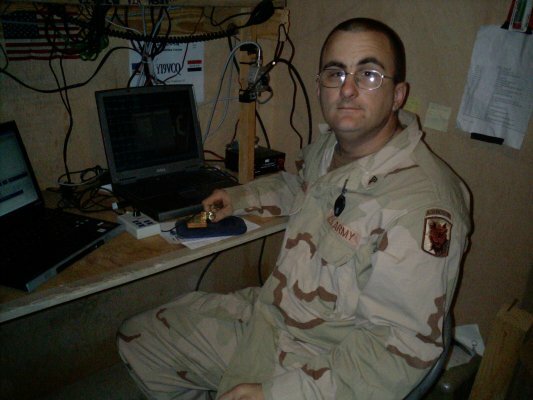 Hello, My name is Korey and I'm presently deployed in support of Operation Iraqi Freedom. Just wanted to tell you a little about myself. I enjoy all modes but CW has been my favorite since obtaining my Novice license at age 13 in 1984. All contacts or runs I make are started at 5 watts but I do go higher if needed. My most fun with QRP is when I use my 750-mw 40m transmiiter and Realistic DX-440 receiver. My equipment consists of an Icom IC-706Mk2G, 160-meter Windom, W4XT Keyer, Bulldog Mini-Paddle, and Rigblaster Pro interface. 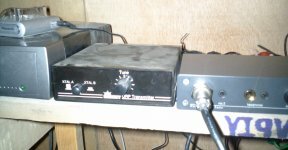 The Rigblaster is a recent addition to the shack and I've produced amazing results on PSK31 with only 5 watts. I can be found on all bands and modes. My log consists of 946 QSO's since December 2004, of which two-thirds are CW. My personal goals are to reach 5,000 QSO's and obtain the EQSL Edx100 award by the time my deployment ends. Conditions to the USA are marginal on 80m CW right now but I hope conditions improve on the higher bands this summer. I'm still awaiting my first contact with the good old USA! Thank you for allowing me to become a member and I hope to see you on the air someday.